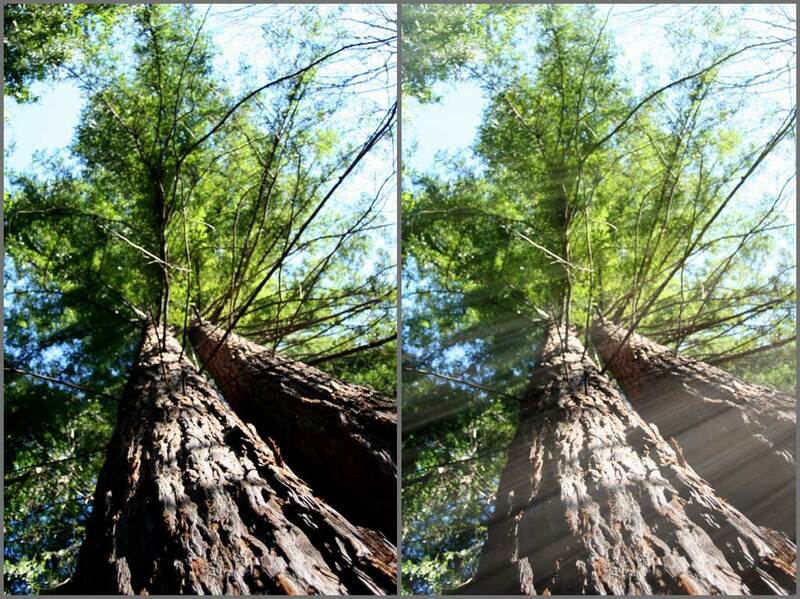 Here’s a quickie but goodie – how to make realistic streaking sunbeams that “filter through” trees, clouds or other background scenery. This is a surprisingly simple technique with one little not-so-obvious selection technique. Load up the original image and let’s have at it!!! To create this effect you want to pick the brightest part of your image – where the light is showing through your background. 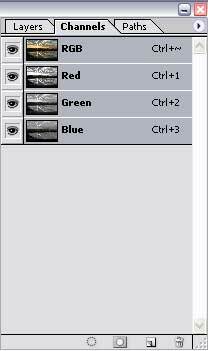 The quickest and easiest way to do this is by using the channels tab in your layers window to make a Luminosity selection. Seriously? Yep, if you select the upper RGB Composite channel while holding down Ctrl/Cmd, Photoshop automatically picks the brightest parts of your image. Pretty cool stuff! Now for the magic…hit Ctrl/Cmd + J to jump the selection onto another layer and then head up to Filters > Blur > Radial Blur. In this dialog select the Zoomoption and set it to 100%. In the target area move the center to approximately the location of where the sun should be in your image. Click OK to create your basic streaks. Once the filter runs check to see that your streaks are centered on your sun…you can either re-run the filter and move the center target or just select the move tool and shift your layer around until it’s centered. 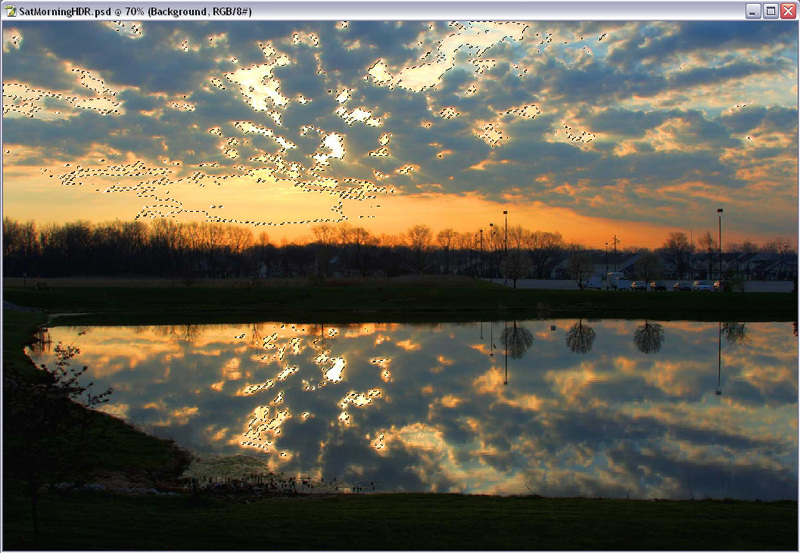 First run of Blur filter - notice the sunbeams look "short"
Now that’s pretty cool…but look closely. Depending on the image you might want to run that same filter again. On the first run, the streaks were chopped short and didn’t quite look natural. You might also want to increase the intensity a bit by duplicating the layer a couple times (Ctrl/Cmd +J). Merge the light ray layers and then set your blending mode option to Screen. Create a layer mask (Here’s a tutorial on layer masks) on your finished light layer and using a large soft brush clean up any edges of the rays that look strange. I also reduced the opacity of the brush to around 60% and used that to reduce the strength of the rays below the horizon line. Once you’re happy with how that looks create the reflection in the pond by duplicating the layer (Ctrl/Cmd + J) and then flipping it vertically (Edit > Transform > Flip Vertical). Pick the move tool and center this on the reflected sun and then select the layer mask and brush around the pond with a large soft brush to keep the rays from going past the shoreline. Finally, reduce the opacity of your light layers until you like the way they look. 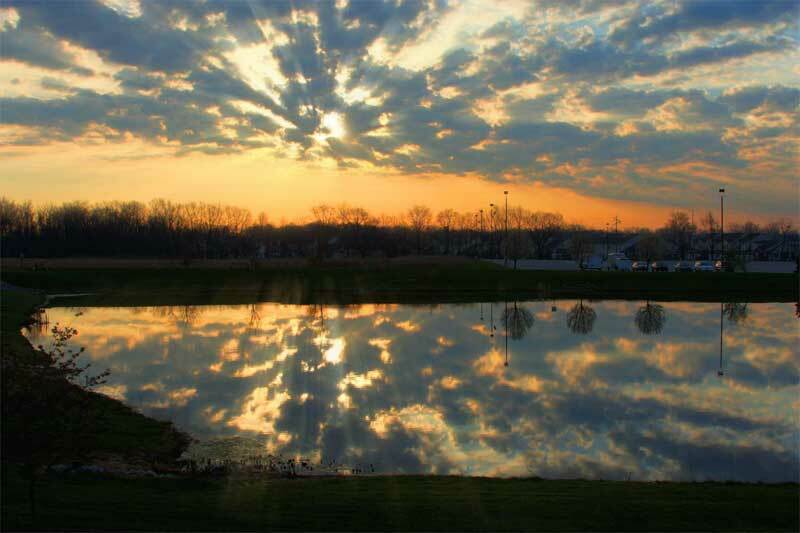 I chose 75% for the main set of sunbeams and 50% for the reflected layer. Another consideration you might try in different images may include experimenting with the transform command (Edit > Transform) to scale the rays up so that they cover more of the image and seem to shine through on everything in the foreground, or if your image has the sun out of frame use scale and rotate until the streaks are coming across the image from the direction of the sun (like the before / after image of the trees below). Don’t forget to use layer masks to control any streaks that look out of place. That’s all there is to it – lots of fantastic heavenly sunbeams. Now if only I were a cat…Meow?